High School students always appear hungry. It seems like there is always some scam to to get food or trade for food. On Maslow’s Hierarchy, the base Physiological need has to be met before teachers can ever hope for students to start learning. However, there is carpet in the library, and my base need is to make sure that the custodians don’t hate me. Preventing students from eating and drinking in the library was becoming a management nightmare. I didn’t want to deny students their right to sustain themselves during study halls; it didn’t bother me that they are eating. 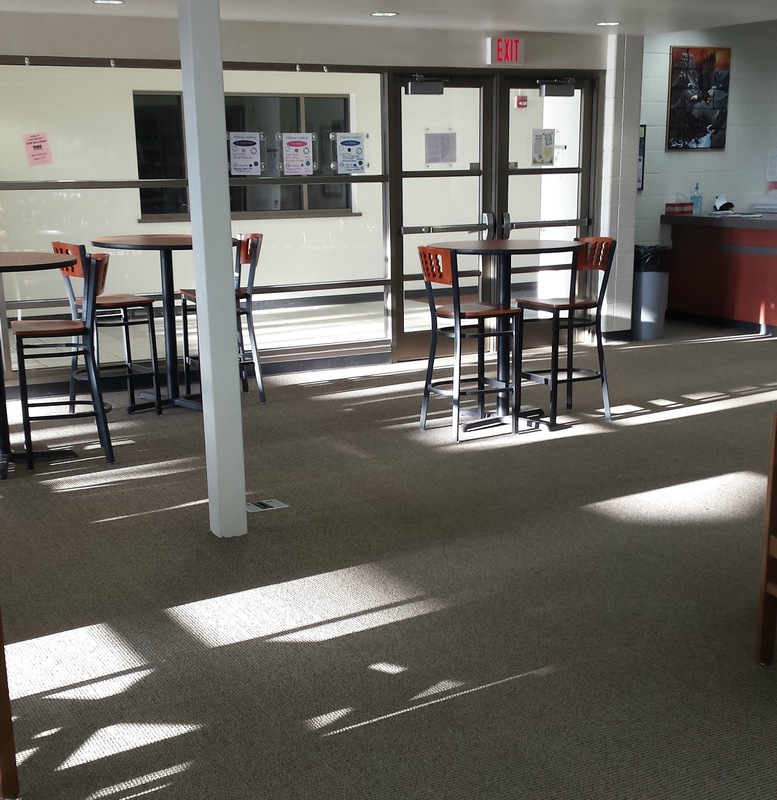 However, food and color beverages are the enemy of clean carpet, and the custodians do not have the time to continually clean the carpet after accidental spills. One of the first pieces of advice that is given to new teachers is to make friends with the school secretary and custodian. This has proven to be true many times in my teaching career. The individuals in these positions have helped me more than I can adequately capture in this post, and I need to make their life easier. 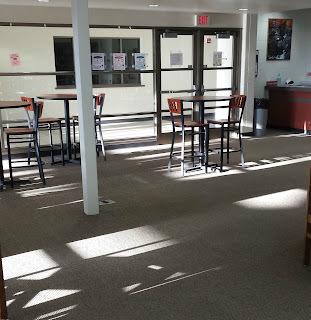 In brainstorming ideas to address the problem, I proposed to the custodial staff to change the flooring in the front of the library to a laminate or title that is easy to clean. Drinking colored beverages and eating would only be permissible on the new floor. Bryan Groshek, second shift head custodian, agreed that this was a workable solution. I truly only cared about the color; Bryan cared about the durability and wear of the material. Making sure that both of our needs were met, Bryan facilitated the consultation and installation from local company that the school had used in the past. I was involved with the consultation and picked the color after Bryan picked the material. The new floor was installed over Spring Break. To get student buy-in, I ran a contest for students to name the new snack area. They were allowed to enter as many ideas as they wanted. The prize was a delivered lunch from a restaurant of their choice (within reason). The students really liked this prize, and it cost under $10 for me. The winning name was “Crumb Corner” with “Read and Feed” coming in second. Collaboration Opportunities Unexpected collaboration came about with Crumb Corner. Some librarians might chose to sell food or beverages, but I made a conscious choice to not to do that. I do not want to compete financially with the school breakfast program or the culinary art students’ Warrior Express. However, I can support the programs by allowing them to set up a satellite station in the library, an option that was never open to them in the past. Students also bring in their purchases and can now enjoy them in library with friends. It has the potential for some awesome collaboration opportunities. The Crumb Corner is very popular, especially during first and second hour. Students can now bring in their coffee and actually drink it. Many kids bring breakfast to school since the first bell is at 7:25, and I don’t like to eat before then either. The students tell me that they appreciate that they have a place for them.